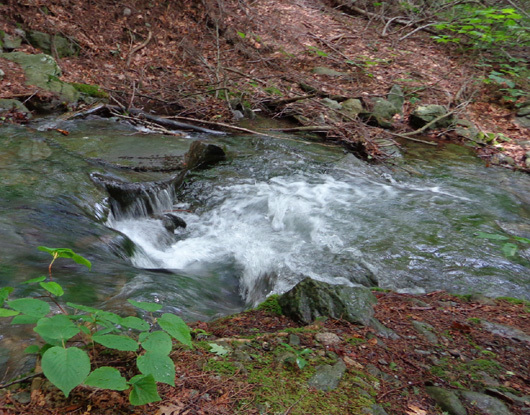 a lot of rain or snow melt, the series of falls and cascades are breathtaking. Even during times of drought a quiet, peaceful world can be found . 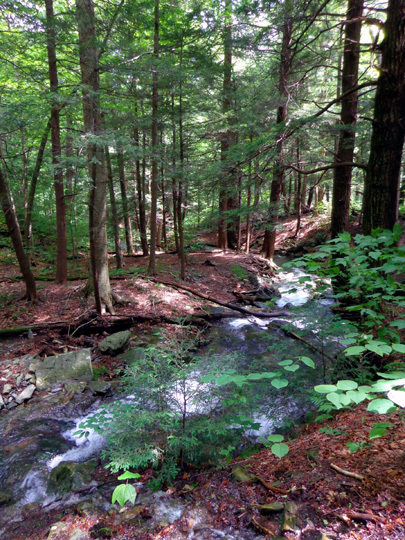 . .
Sages Ravine is truly unique around these parts and a must-see spot for all hikers." 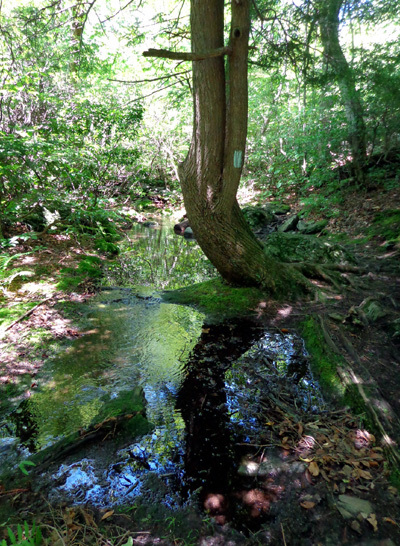 Today I got to hike on part of the Appalachian Trail that was on my Top Ten Sections list from my thru-hike/run in 2005 -- Sages Ravine, which is on both sides of the MA-CT state line, and CT's Bear Mountain (there is another Bear Mountain on the Trail in NY). 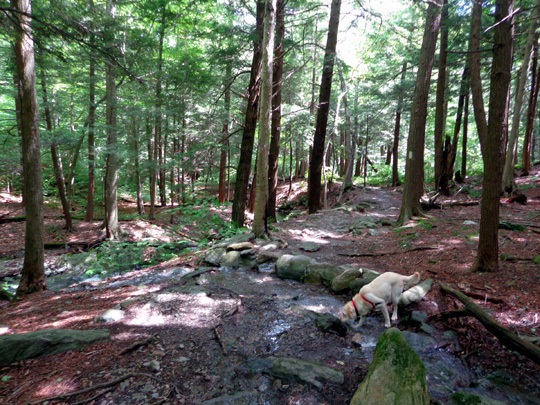 Because this section is too far for me to easily hike point-to-point or even out-and-back from the trailheads I used nine years ago when I could run and cover more territory, Jim, Casey, and I went up from CT 41 on two side trails and made a counter-clockwise loop with the AT. 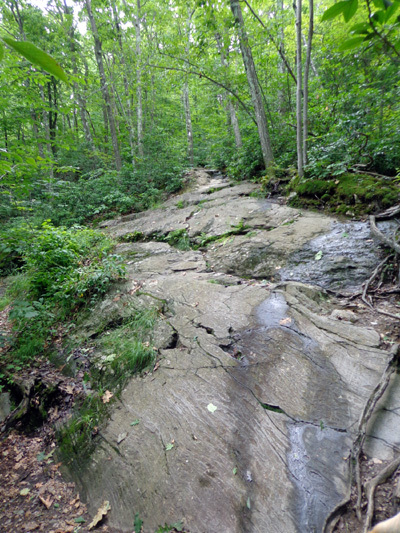 The website above, which is written for average day hikers and not hard-core ones, calls this loop a "strenuous" option. In 2005 I would have dubbed it "moderate." Now that I'm not trained as well -- and nine years older -- I agree that it's strenuous for the average person. 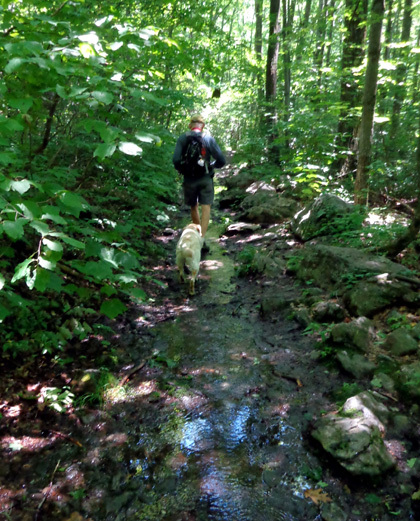 Today we covered over six miles on the Undermountain, Paradise Lane (anything but! ), and AT and it was hard on both of us, especially Jim. He can bike like crazy but his bad knee prevents him from doing much walking or hiking, especially on a gnarly loop like this one. Casey did fine, with more energy at the end than either Jim or I had. I'm glad we didn't take Cody. 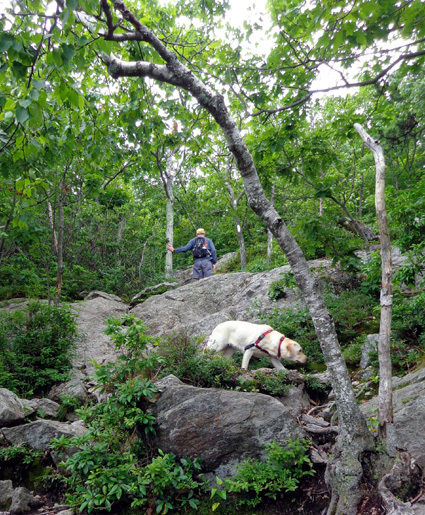 Although he could hike difficult sections like this with me in '05 when he was only two years old, at ten the rocks would have been too hard on him. I did OK because I've done more hiking than Jim has but it was more difficult than any hiking I've done since last summer in the Rockies. The worst was going up the north side of Bear Mtn. (southbound) to the summit from Sages Ravine. I went the other direction in '05, which is one reason I didn't remember the difficulty. Even with bad knees it would have been easier for me to descend that way today. Although . 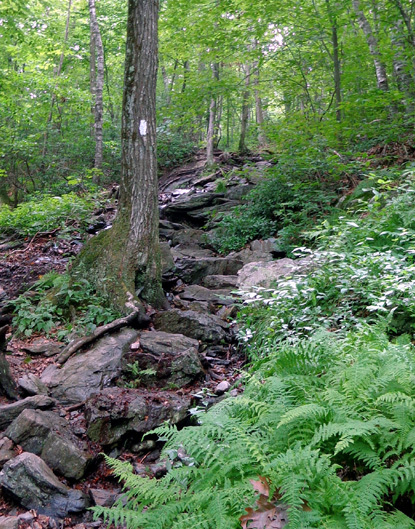 . . when I get on the even gnarlier trails in the White Mountains of New Hampshire next week I'll probably look back on this hike as "easy" in comparison! 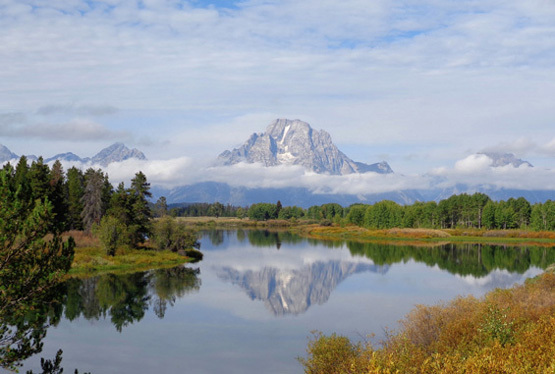 The weather was great today -- upper 50s overnight, clear blue sky in the morning, mid-70s in the afternoon, with pretty clouds and a breeze in the afternoon. We started about 10 AM and finished about 2 PM. 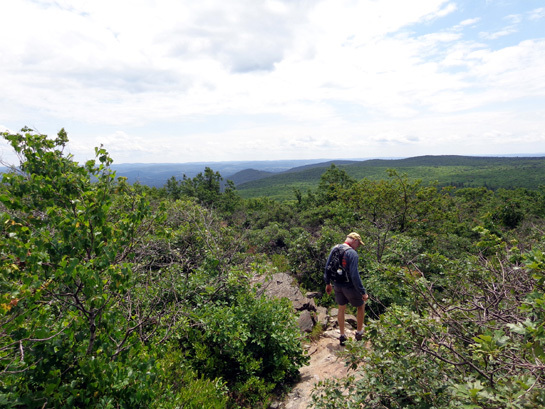 Elevations ranged from about 900 feet at the trailhead to 2,316 feet on the top of Bear Mtn. 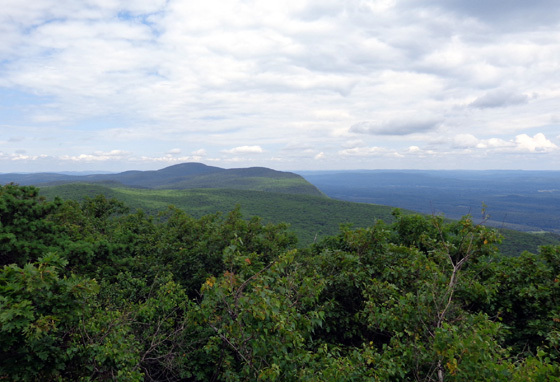 It's the highest peak in CT -- but not the highest point in CT; that's on the flank of Mt. Frissell, whose summit is in MA. The trailhead parking area is 9.3 miles south of the PA 41-23 intersection in S. Egremont. There is room for only about a dozen vehicles. Three were there when we arrived and about ten when we left. 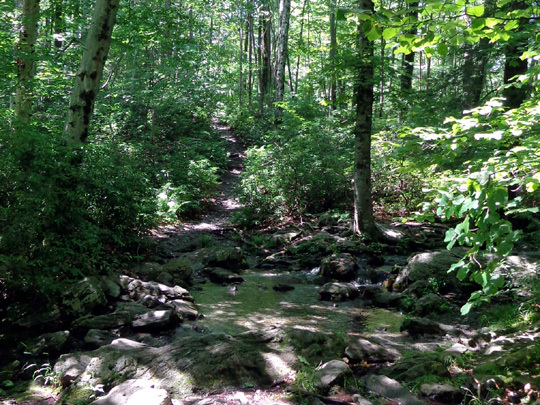 We climbed a mile on the Undermountain Trail, then turned right on the more narrow but less hilly Paradise Lane Trail. 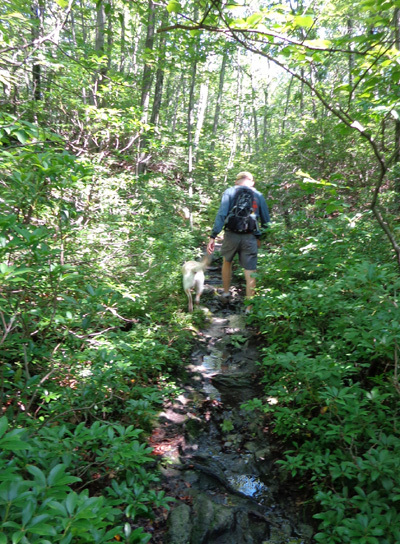 At that intersection it is only 9/10ths of a mile to the AT on the Undermountain Trail. It intersects on the south side of Bear Mountain at Riga Junction. That's a shorter way to get to Bear Mtn. summit but I wanted to show Jim the beautiful Sages Ravine first. 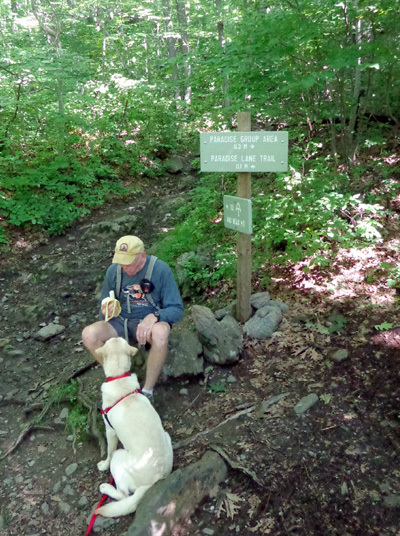 Jim shares a banana with Casey at the Intermountain-Paradise trail intersection. 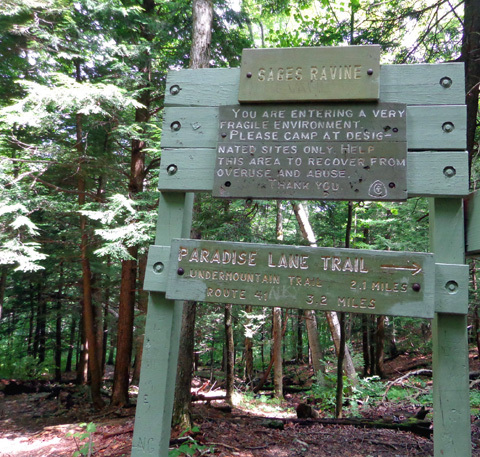 We hiked another mile on Paradise Lane to reach the AT. "Paradise Lane." That conjures up a rather wide, smooth trail, doesn't it? 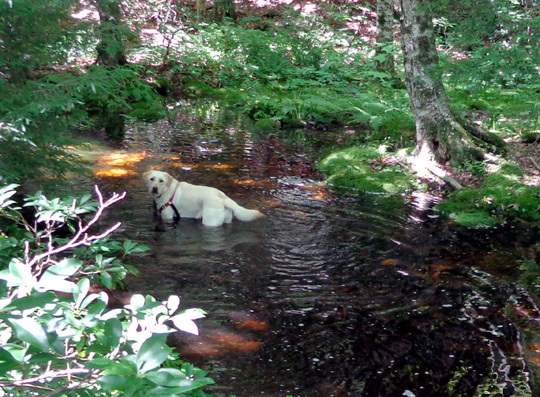 Casey-the-Lab loved all the water, of course. 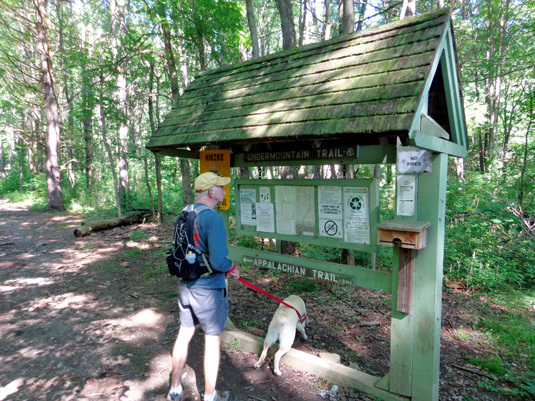 It was a relief when we reached the intersection with the AT and the sign pointing north toward Sages Ravine. 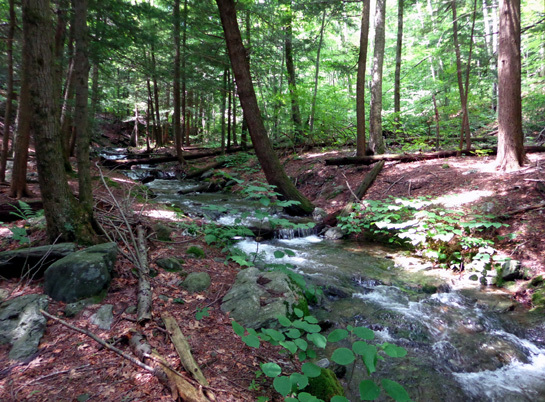 I didn't remember that section of the AT being rough, just very serene along Sages Creek. I've either been on too many trails since then or I have selective memory. Fortunately, the AT was wider and easier to follow than Paradise Lane. 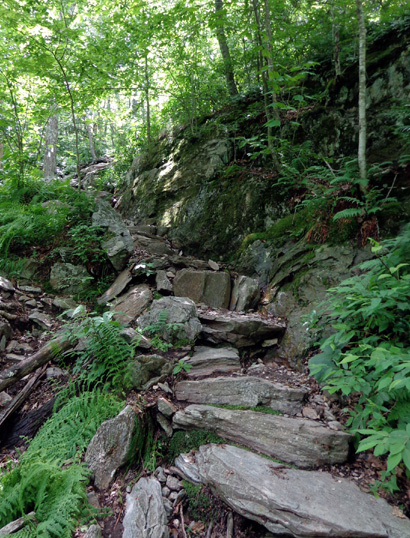 Unfortunately, the AT descends through more rough rocks for about 1/4 mile to Sages Creek and the beginning of the ravine. The creek was clear and beautiful today. With all the recent rain in the area, it looked much different than it did when I saw it in '05. There was much less water in it then but it was still memorable. 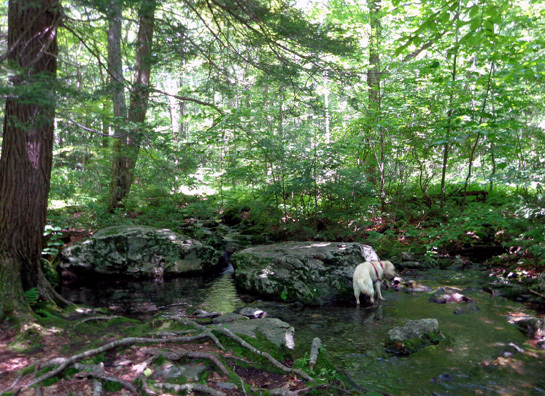 Casey drinks from a little feeder stream along Sages Ravine. We found some rocks to sit on near a little waterfall (above). Casey had fun playing in the water while we ate our lunch. 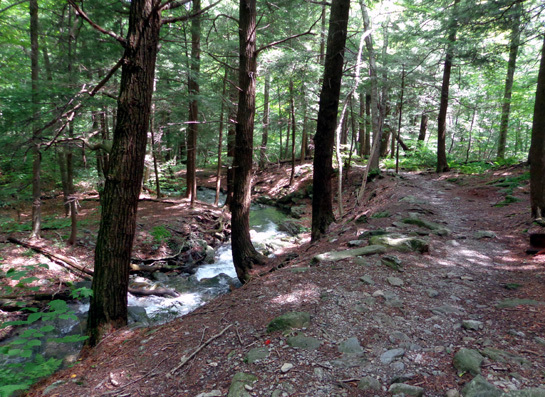 The whole time we were in the ravine we saw just one person, a thru-hiker heading north. 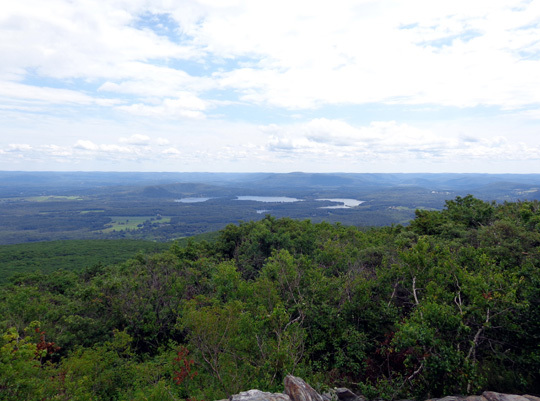 It was a strenuous hike back uphill on the AT to the summit of Bear Mountain. I apologized profusely to Jim. I never would have suggested he hike up there with me if I'd remembered how rough it was. 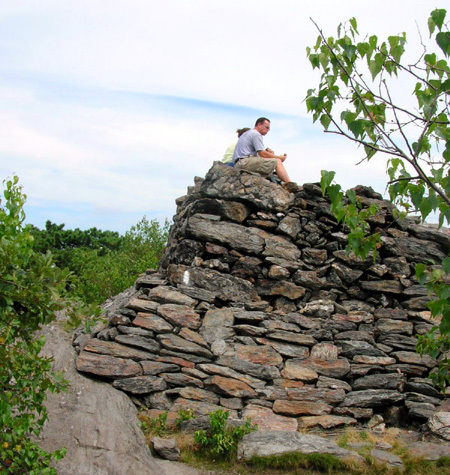 At the summit of Bear Mountain is a large rock cairn about 25 feet square and 12 feet tall. It is the remains of a tower built in 1885 by Owen Travis, a Salisbury mason, and paid for by Robbins Battel, who leased the top from the Millerton Iron Company. The tower stood unharmed for eighty years but has since been vandalized. It is now only one-third of its original height. 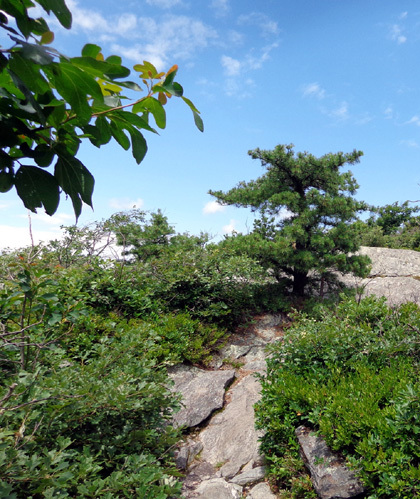 We reached the rock tower on Bear Mountain summit just after two young women who day-hiked in from the south. They were doing the loop clockwise; we did it counter-clockwise. A middle-aged section hiker from Poland soon joined us on the rock tower to enjoy the breeze and fine views to Twin Lakes in the pretty valley to the east. He's doing the AT in four quarters. 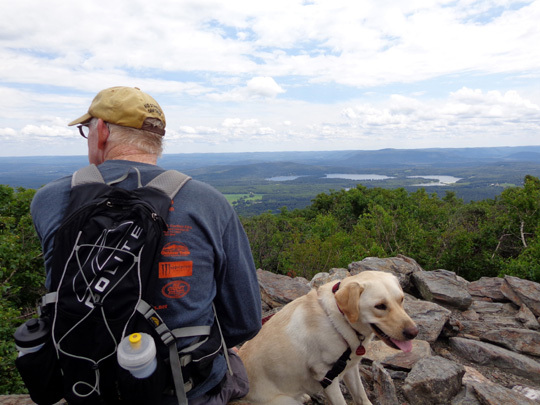 This year he's hiking north from Harper's Ferry to Bennington, VT. It was fun to talk with him about other long trails he's done in Europe. One other day-hiker joined us. All four left, heading north, before Jim and I started down. Two other young NOBO hikers arrived as we were leaving the tower. Looking back up some bedrock we just came down; glad it was dry. We got back down into taller trees in less than a mile, just before reaching Riga Jct., where we got on the Undermountain Trail. This interesting reflection took my mind off all the rocks and water. 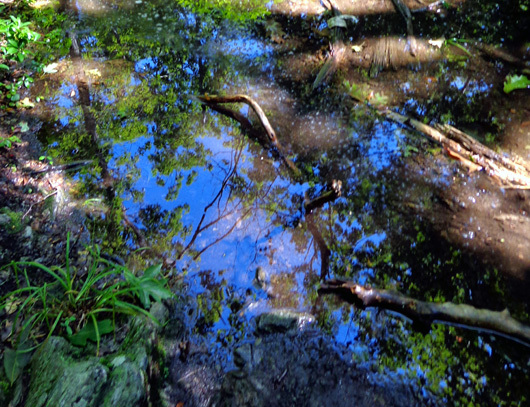 Sometimes the trail was a creek because of all the recent rain. The final mile was the one we went up at the beginning. It is rockier and more steep than the upper half closer to the AT. The trails today were very, very wet from all the rain that fell recently. 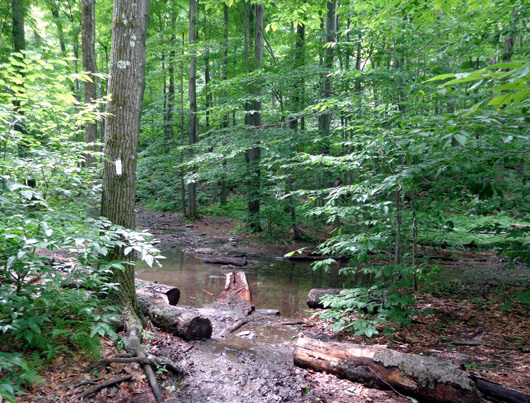 There were numerous puddles, several little creeks to ford, and lots of mud. Casey loved that, of course. Jim and I just plowed through it all. I did OK with the one trekking pole I carried and neither of us fell down. All but about a mile of the six-mile loop was in the shade, which was nice since it was warm. We saw very few flowers even on the sunny open ledges on the south side of the mountain, and it was too early for any ripe blueberries. We saw only ten people and two dogs on the trail loop. Casey was off-leash most of the time. 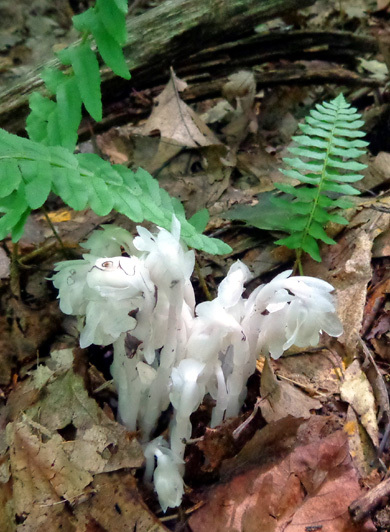 Indian pipe is as interesting as most flowers. I'm glad I had the opportunity to see Sages Ravine again. I'm just sorry neither of us was in as good shape physically as we needed to be to really enjoy this beautiful area. Any bets on how long it is before Jim will go on a hike with me again?? ?